Not before few hours we had learnt that Prabhu Solomon and Dhanush have started shooting their untitled next in the beaches of Goa. With all such invigorating news spreading across the towns, we have a buzz that Prabhu Solomon has signed ‘Kayal’ Chandran to play lead role in his next home production, under his God Pictures banner. This untitled film would be directed by Anbazhagan, a former associate of Prabhu Solomon who shot to fame with maiden debut ‘Saattai’. The official announcement pertaining to this project would be made shortly once others in the cast and crew are finalised. This is the first time Prabhu Solomon has teamed up with the same actor for second time and it has gradually sent Chandran on irresistible jubilations. When contacted Chandran, he was tight-lipped about the project. “It’s better if the production house reveals the news first,” he said with a smile. The actor says that he has been receiving many offers. “Prior to release also, I had been getting offers but I wanted to enjoy every bit of the honeymoon period before the release of my first film! Once Kayal released, the pressure to make the right choice for the second film began building up. I was hesitant to accept just anything since the roles offered were similar to that in Kayal in which I play a vagabond traveller and lover,” he says. 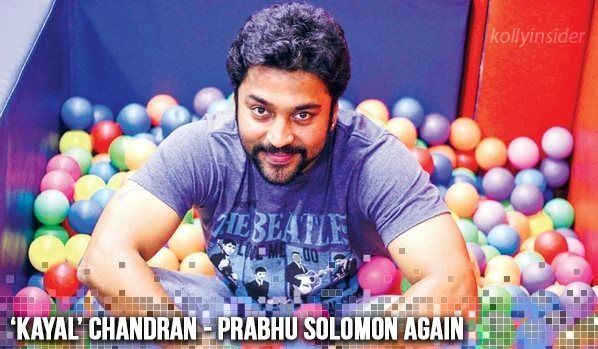 Chandran continues to be lucky, given his second flick also is will his mentor Prabhu. “It’s a big honour and opportunity for me, since Prabhu sir usually doesn’t work with the same lead actors again. So if he’s casting me, I think that’s a huge step ahead in my career as a newcomer. I feel really blessed. In fact, he had announced during the audio launch of Kayal that he would work with me again, but when he actually called me up for it, I was ecstatic,” says Chandran with a smile. The icing on the cake is that his role is going to be very different from that in Kayal, and will give him huge scope to perform. A little birdie tells us that the film will be going on the floors this month and the pre-production work has been going on for the past two months. The movie is set in a small town and the rest of the cast and crew are being finalised. While the heroine will be a newbie, D Imman, who has given hit music in sync with Prabhu’s sensibilities in the past, will be composing the music. Yugabharathy will be writing the lyrics.